Menara Moroccan Restaurant knows how to do Moroccan cuisine right. This well-respected San Jose restaurant has been pleasing customers for over three decades. Located just minutes from downtown San Jose, this fine dining establishment provides a unique experience unlike any other. Menara has several different menus, each with multiple courses of delicious food. Le Dinner Menara is one of the restaurant’s most popular, and features six courses including the dessert of traditional mint tea and baklava. Le Dinner Menara includes Lham Mrhosia—lamb with honey—a Menara favorite. The tender meat is perfectly complimented by the sweetness of the honey and always leaves patrons wanting more. Menara also caters to vegetarians, and has an entire dinner devoted to meatless dishes. Le Dinner Vegetarian begins with the appetizing Salade Moroccaines, a Moroccan salsa-esque salad served with bread for dipping. At Menara, dinner comes with exotic entertainment performed by beautiful belly dancers. Belly dancing begins at 8pm, so it’s best to arrive early and enjoy a drink from the full bar. The Moroccan Magic, a delicious cocktail prepared with juices, brandy and rum, is an excellent way to start the meal. Menara’s belly dancers love to get patrons involved, so don’t be afraid to learn some new dance moves. This exciting restaurant is also known for having excellent service. For first-timers, Moroccan cuisine can be intimidating. The helpful staff is happy to explain any menu item and walk patrons through a traditional Moroccan meal. Every patron is sure to leave feeling like royalty. Menara’s banquet facilities can easily accommodate groups of up to 300 guests, making it the perfect restaurant for corporate events, rehearsal dinners, wedding receptions or any large gatherings. Delicious food, beautiful dancers and luxurious accommodations will make any event unforgettable. Menara’s location makes it ideal for groups of visitors to San Jose. It is just minutes from downtown, the airport, several hotels and easily accessible from the VTA Light Rail or any of the area’s highways. Menara is also available for lunch banquets of 25 or more. 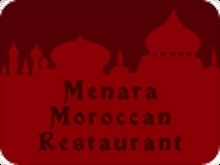 For large events of all kinds, it’s hard to beat Menara Moroccan Restaurant in the heart of the Silicon Valley.